Villa Minh spills down the hillside, with five levels offering fabulous views from every room. From the car park on the top level, a lift or stairs take you down to the elegant dining and living room pavilion, with a large kitchen set just behind. A stairwell with a waterfall feature leads down to the pool terrace and barbecue area. Set back from the terrace is the entertainment room and a king-bedded guest room. At one end of the pool, in a separate pavilion, is the first master suite. From this level, take another lift or the stairs down to the second master suite and a guest bedroom with two queen beds. 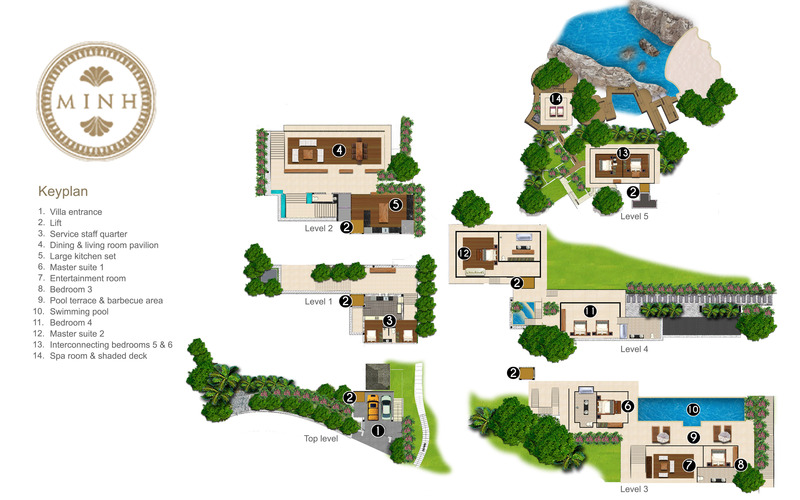 Two connected bedrooms are found just below, also reachable by the lift or stairs, while a walkway down the hill leads to the spa room and shaded deck. Villa Minh’s elegant, glass-fronted, two-floor living pavilion offers wide views and natural light. Its upper-floor formal living and dining area is a restful haven with large chandeliers dangling from a gorgeous peaked timber ceiling, textured stone walls, soft oversized sofas, a square dark wood dining table and enchanting Asian art pieces. Tucked behind is the guest kitchen with modern stainless steel amenities including a breakfast bar and large wine fridge. Downstairs, next to the pool, is the entertainment room, a more casual gathering spot with rich red padded walls framing a cosy TV lounge, pool table and bar. A lift connects the living-dining room to the car park entrance, while a second lift links the entertainment room and pool terrace to the bedrooms below. At the heart of Villa Minh is a wide marble terrace furnished with sunbeds, a 17.5-metre infinity pool with built-in jacuzzi, and a barbecue area. Those seeking a relaxing escape could stroll down through the hillside garden to the spa room, an air-conditioned pavilion completely enclosed in glass with two spa beds and comfortable armchairs. Stretching out in front is a tree-shaded wooden deck furnished with loungers. Peak-roofed pavilions house Villa Minh’s two master suites which both feature king-sized beds, TVs and wraparound balconies with wide views. Relax and refresh in marble ensuite bathrooms with double vanity sets, rain showers and luxurious soaking tubs set next to picture windows. One of the suites opens to the pool, while the other is one floor down with lift access to the pool terrace. With sliding glass doors opening to the terrace, this king-bedded room with ensuite bathroom is ideal for guests who want to start the day with a dip in the pool. Lying next to the media room, this guest suite has an aquatic flavour with blue-hued design elements accenting its pool and sea views. Situated on the same level as the second master suite, this large room is furnished with two queen-sized beds, TV and sofa. Its ensuite marble bathroom is elaborately appointed with a soaker tub, rain shower and double vanity. Glass sliding doors open to a balcony with unfettered sea views. These interconnecting rooms, ideal for a young family, are on the lower floor of the main villa and share a bathroom. Bedroom 5 has a queen-sized bed and sliding doors opening on to a balcony with beautiful views across a small bay. Bedroom 6 is king-bedded and equipped with a desk, TV and DVD player, balcony and a lift that links it to the pool terrace.